This is the first in a series of walks between two different stations. As walked route from Pilning Station to Severn Beach station. 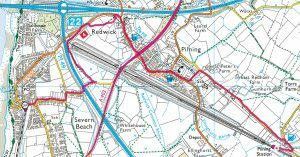 On the 20th January I finally walked a route that I’ve been looking at on the map for ages, with the added bonus of ticking off an ambition to get to Pilning station. Pilning is not the easiest of stations to get to – it isn’t even listed in the timetable anymore. Instead there is a note against two Saturday trains from Cardiff to Taunton saying “Also calls Pilning”. The timetable also advises that to get there from Bristol requires a change at Severn Tunnel Junction. This reflects the removal of the footbridge and the resulting closure of the westbound platform. 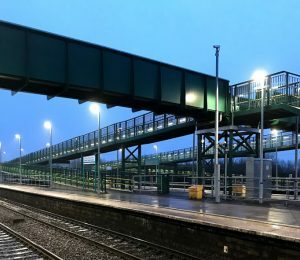 There are now no direct services from Bristol Temple Meads. I caught the 07:23 GWR service from Bristol Temple Meads towards Cardiff Central. 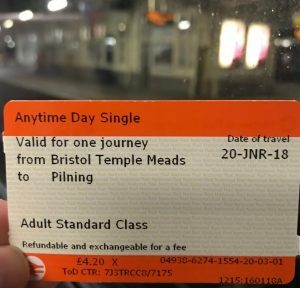 The guard commented that in 10 years in his job, he had never checked a ticket for Pilning before! However, he knew the route and told me where to change. Impressive. Severn Tunnel Junction is a strange station – seeming to consist mostly of enormous (presumably accessible) footbridges. I guess in theory it serves the village of Rogiet, and other local commuter traffic. Perhaps it is busier later in the day or in the week but it was extremely quiet when I was there (253,918 entries and exits in 2016-17, so yes I guess it gets a bit busier). 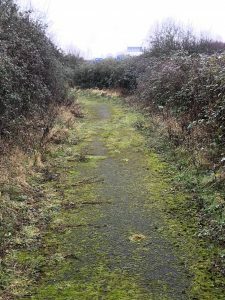 I will be back to explore another time – not least to make the walk to nearby Caldicot station. Next up, the 08:26 to take me back through the Severn Tunnel to Pilning. This time the guard was confused by my ticket (because it was from Bristol) and didn’t understand what I was doing. She let it pass because it was “hardly any distance”. I had the timetable on hand to explain if I’d needed to. On arrival at Pilning I was handed a Station Guide leaflet by one of the passengers getting on, who presumably has some part in the running of www.pilningstation.uk (we didn’t really have time to talk!) This contains a really interesting history of the station itself and the railways in the surrounding area. Definitely has me piqued my interest enough to come back and explore. Pilning itself shows its neglect. It is run down, has no facilities and at present is surrounded by a building site – working on the electrification of the line I guess. While this is a shame, I can understand the lack of investment. 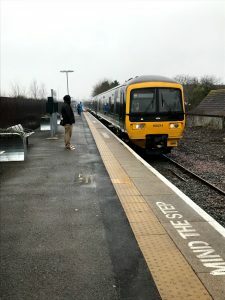 It is not a well-used station (230 entries and exits in 16/17 – though this is a large increase from the 46 the year before), and it is in an awkward place – not really that close even to the village it serves. Nevertheless, I suppose it would get more use if there were more than 2 trains a week! The history of the station is interesting – see http://www.pilningstation.uk/tell-me-more/the-past for more details. I may write some of my own thoughts in a future post. So at last the walk! This is a pretty straightforward route, starting off along the road towards Pilning village. I took the footpath through the allotments and cemetery of St. Peter’s Church. 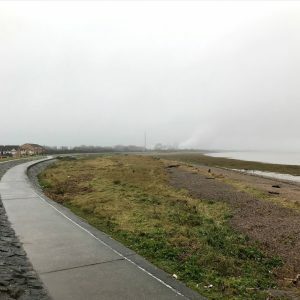 At this point I think you can still make out where the old train line from Pilning Low Level to New Passage Pier passed through, taking passengers to the ferry across the Severn. I didn’t have a lot of time to stop and explore, but still I was as stubborn as ever about actually following the footpath, even when this probably isn’t strictly necessary. The footpath that cuts the corner across the fields as the B4064 curves around to the SW is a case in point – it was not easy to find, was obstructed and covered with brambles and when I did get to it, was across a very muddy field. Having done it once, in the future I will probably just follow the road around. However, the next section alongside the M49 is well worth walking along – the path is good and it feels odd walking right next to the motorway. The footbridge over the motorway was a revelation too – it wobbled! And so to Severn Beach. The “seaside” town that time forgot. A very unusual place indeed. Today I did not have time to seek out the disused amusements, or really to take in any of the atmosphere – the weather was rapidly worsening and I was just glad to get to the station and catch the train back to Temple Meads. The header photo for this blog gives an idea of the conditions. The Severn Beach line is wonderful. It starts with the bleak industrial landscapes of Avonmouth and the Severn Estuary, then runs down the beautiful Avon Gorge and finishes up through the heart of Bristol itself. I am already planning many excursions along the line. This was a terrific morning out – some interesting train journeys and an easy walk. The only thing missing was a pub or two. It was too early in the morning on this occasion, but I will be doing the walk in the opposite direction in the future, and there are two pubs to visit in Pilning – one of which is conveniently near the station. Perfect.